The Holidays are officially here and that means lot’s of party food. When I was home last week I made these for a cocktail party and they were a big hit. I like serving items that you can pick up and move around with and these fit the bill. I used chard and collards in these but feel free to fill with whatever vegetables you have on hand. 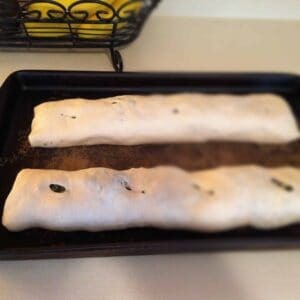 Makes 2 Stromboli, about 12 slices per Stromboli. Mash tofu with fork or potato masher until crumbled. Add remaining ingredients and mix completely to combine. Let sit while you prepare the rest of the ingredients. Prepare the filling: Stack collard and swiss chard leaves, roll up starting with one side like a cigar. Starting with one end, finely chop the leaves so they end up looking like thin ribbons. Chop the onion in half and then lay on a cutting board, chopped side down. Slice into very thin 1/2 moons. Heat the oil in a skillet pan, add the onions and a pinch of salt. Cook for 5 minutes or so until the onions are translucent. Add the chard and collard leaves and cook until completely wilted. Add the lemon juice, cayenne pepper, and thyme to the skillet. In a large mixing bowl combine the greens, the ricotta mixture and the mozzerella cheese. Taste and season with salt/pepper if needed. Roll out the pizza doughs to an oblong rectangle shape. Place 1/2 the mixture on each of the doughs. Starting on one end, gently roll up the dough around the mixture, folding and tucking the ends as you go. Cut off any excess dough at the end of the roll and seal with your fingers. 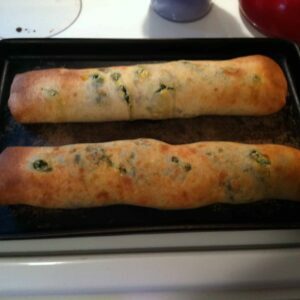 Place finished rolls onto a lightly greased baking sheet or pizza stone. Cut a few holes into the top of the dough for steam to escape. Bake at 400 degrees F for 30 minutes until golden brown. Remove from the oven and let sit for 5 minutes. 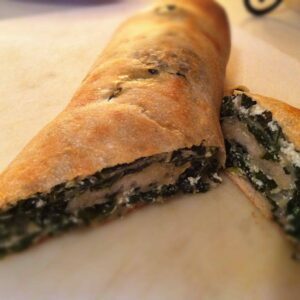 Slice the Stromboli and serve! 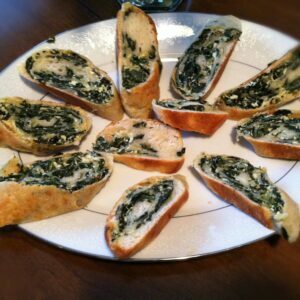 What are your favorite holiday appetizers?